Last year Japan was devastated by a massive earthquake, followed by tsunami and the failure of nuclear reactors at the Fukushima nuclear power plant. This was the second largest nuclear disaster after Chernobyl in 1986. As what happened during the WW2, Japan quickly get back on its feet and recovered. Landscape of energy production has taken a relook and the Japanese government was quick to look at renewables to supplement the reduced amount of energy obtained from nuclear plants. Like many other countries, including Malaysia, under the new policy utilities in Japan must buy all electricity produced from green sources such as, wind, geothermal, and solar at premium rates for the next twenty years. This should be good news as Japan, as a big economy, could spur the renewable energy industry particularly solar PV. The expected sudden increase demand could bring down the cost to produce renewable energy. The look east policy during Dr Mahathir's premiership is still very much relevant. The work culture that brought Japan to where it is today must be emulated in order for Malaysia to achieve its high-income, developed nation goal. Our Feed-in tariff under the Renewable Energy Act 2010 is 'older' than Japan's similar policy. But while we are still crawling in implementation, Japan is already gearing for massive investment in renewables, and in solar PV alone, there is already indication that Japan is poised to quickly overtake Germany and Italy to become the world's second-biggest market for solar power by creating an estimated $9.6 billion market. So, don't just watch them. Take action! TOKYO, July 4, 2012 (AFP) - Even as Japan begins cranking up its nuclear reactors again, Tokyo has launched a scheme it hopes will spark a green-energy revolution and put the country at the leading edge of renewables. The scheme comes as Japan debates its future energy policy, and is squarely aimed at forcing change in the way Japan's enormous -- and powerful -- utility companies operate. The tsunami-sparked meltdowns at the Fukushima nuclear plant in March last year led to the shuttering of Japan's entire stable of reactors. They forced Tokyo to turn to expensive fossil fuels to replace the third of the country's electricity the atomic plants had produced. Analysts say despite public fears, nuclear is here to stay for the foreseeable future, but resource-poor Japan must rebalance its energy mix and make greater use of renewables. The so-called feed-in tariff could spur a whopping 85-percent rise in solar cell demand in Japan this year alone, according to Nomura Securities, and "trigger a full-scale launch of large solar farms in Japan". "New solar cell installation could expand further if the uptake of inexpensive, Chinese-made solar cells accelerates," Nomura analyst Kyoichiro Yokoyama said in a research note. The amount of new solar power capacity that Nomura predicts for Japan this year is equal to about two nuclear reactors. "I want to use it as a trigger to fuel the use of renewable energy," Industry Minister Yukio Edano said recently. "It is clear that additional cost is necessary to promote greater use of renewable energy and to end our reliance on nuclear plants as soon as possible," he added. Japan gets less than two percent of its power from renewable sources, rising to about 10 percent including hydroelectric power, but still below other industrialised nations. As of 2010, Japan's solar power output was about one-fifth that of Germany, while Tokyo was in 12th place globally in terms of wind-power generation. 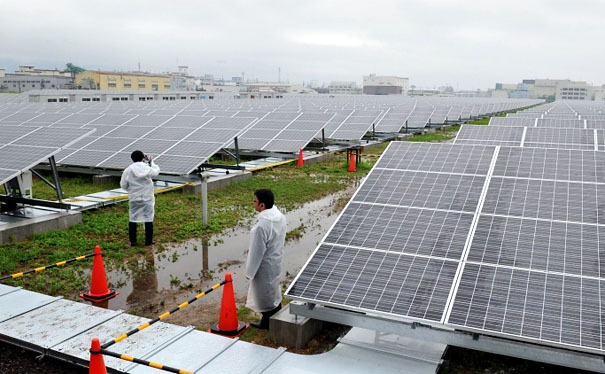 Some Japanese firms have already made their move, including electronics giant Toshiba, which said it would build a huge solar plant on the country's disaster-struck northeastern coastline. Rival Panasonic said it expected a boost in its solar-power system sales on the back of the new programme, which puts Japan on track to leapfrog Italy as the world's fourth-largest solar market by 2014, behind China, the United States and India, according to Nomura. Mobile phone operator Softbank opened a plant in Kyoto at the weekend and has plans to build Japan's biggest solar plant -- in the northern island of Hokkaido. "If we keep building solar panels and invest in solar energy, within 20 years it will not only become the safest and the cleanest source of electricity but also the cheapest," Softbank chief Masayoshi Son told reporters. A group of Japanese firms led by trading house Marubeni plan to build a large floating experimental wind farm that could supply power for over 100,000 households, Jiji Press has reported. Under the scheme, premiums for different forms of renewable energy vary, but utilities must pay 42 yen (53 cents) per kilowatt hour for solar power, over twice the rate paid to operators in Germany, with generation costs in Japan less than 30 yen per kilowatt hour, Nomura said. Those costs are at least three times those of nuclear and fossil-fuel energy, according to government estimates. However nuclear power costs are expected to spike amid heavy compensation and clean-up bills after Fukushima, the world's worst atomic accident in a generation. Critics of the scheme, which came into effect Sunday, say it is too expensive, with most of the extra costs heaped on businesses and households. They say the new contracts are too generous and benefit a small number of green power operators, with few guarantees that they can make it a profitable enterprise and usher in a massive shift for Japan's energy mix. "The 20-year guarantee seems a bit too sweet a deal", said Yasuchika Hasegawa, chairman of the Japan Association of Corporate Executives. "The initial incentive is necessary. But five to 10 years should suffice... I hope they will review this plan." thanks for this wonderfully written and informative post!